Carlos Emmanuel of Hanover plays 8-man but is one of the top returnees in all of KS. Several offensive lineman return after having big seasons in 2016. Check out who to watch in 2017. Stay tuned over the next few weeks as we will do this position by position. This list is alphabetical by last name. Chet Kuplen and Ben Mitchum compile lists and evaluate players every year for every position which help compile this finalized list. This is not a recruiting list or prospect list and players are not ranked. Cooper Beebe, KC Piper, 6-3 305 Jr.
Beebe could develop into a prospect on offensive or defensive line this season. After an all-state honorable mention year last year, this could be a breakout season for the junior who will look to help Piper on a playoff run in 4A-I. Beebe is the younger brother of Colton Beebe, a three-time all-state pick, now playing at Minnesota. Jack Burns, Miege, 6-3 285 Sr.
Burns help pave the way for the state title team in 4A-I last season as the Stags were untouched in the classification once again. With Grunhard gone to Notre Dame, Burns will be the next big name lineman from Miege. Andrew Callahan, Fort Scott, 6-2 265 Sr.
Callahan is more known as one of the state’s top defensive lineman but also doubles as a starting offensive tackle for the Tigers. Callahan has nice explosion on the line and is one of the best lineman Fort Scott has had in several years. Callahan was a first team All Non-Senior from Sports in Kansas on defense last fall. Mac Copeland, Collegiate, 6-5 255 Sr.
Copeland has the frame and athletic build that college recruiters all want and that’s why he has committed to play for the Kansas Jayhawks. He will begin his three year as a starter on the lines for Collegiate this season. Copeland was a first team All Non-Senior from Sports in Kansas last fall. Aaron Clark, Great Bend, 6-7 290 Sr.
Clark is one of the biggest lineman in the state and helped pave the way for Great Bend to a semi-final runner-up finish a year ago. With some added work in the weight room and development you could see Clark become a division one prospect this season. The biggest question mark for Great Bend is how they will replace Jacob Murray. Evan Clark, Derby, 6-3 270 Sr.
Clark paved the way for Derby to a 6A state title last fall for the second consecutive year. He looks to be a division one prospect and will look to lead Derby to a three-peat in 6A this season. Clark is one of the top returnees in the entire Wichita area and was a Non-Senior pick at OL last year from Sports in Kansas. Sam Eddington, Columbus, 6-1 245 Sr.
Eddington has been seeing reps since his freshman year at Columbus and has been an all-state selection the last two seasons in 4A-II. Columbus has been a contender in this division since it started three years ago and will once again be one with Eddington back and all-state selection Keenan Stanley back as four-years starters. Carlos Emmanuel, Hanover, 6-4 295 Sr.
Emmanuel may be a small-town 8-man player but he could develop into being one of the states top prospects by the time it’s all said and done. 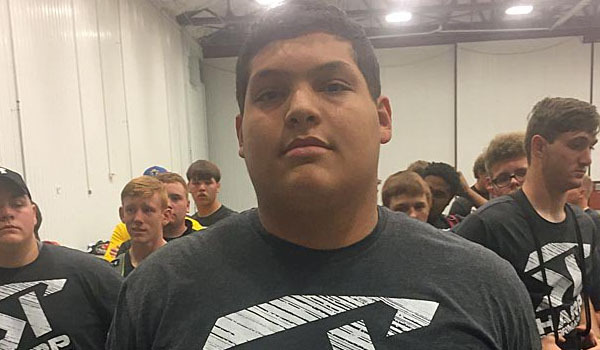 The recruiting process has been slow to start for the 6-foot-4 295-pounder, but he is a freak in the weight room and features a bench press rep max of 225 x 19 times. Hanover is always loaded in 8-man despite being hit by graduation nearly every year. Look for a big year from Emmanuel on offense and defense that could generate him a division one offer. Justin Finnigan, SM East, 6-2 265 Sr.
Finnigan is one of the top returning lineman in the KC Metro area for 2017. The 2018 center is still awaiting those FCS or FBS offers and height may be the only concern, because he certainly gets it done on Friday nights. Finnigan will look to lead the flex-bone rushing attack once again this season and was a first team All Non-Senior from Sports in Kansas last fall. Matt Garza, Topeka, 6-6 325 Sr.
Garza may need some work to develop into a top tier prospect but the frame and size is certainly already there. Topeka, under Walt Alexander, has shown they are a capable team in 6A over the past few years and with a few stud lineman back and one of the nation’s top sophomores, Ky Thomas, they should be bac in the mix for 2017. Hayden Gillum, Plainville, 6-3 245 Sr.
Gillum developed into one of the top defenders in 2-1A a season ago after a breakout campaign in helping the Cards to a 2-1A runner-up finish. He has transformed his body by adding nearly 35 pounds this off-season to potentially be a prospect at OL at the next level, however his best suited position may be as a DE, even though he is also a LB. Gillum can play in a variety of spots and hasn’t seemed to miss a beat with speed with added weight this off-season. Look for a big year for this small-town prospect in Western Kansas. Jacob Glendinning, Washburn Rural, 6-5 290 Sr.
Cade Holmes, Shawnee Heights, 6-3 265 Sr.
Holmes is an explosive lineman in 5A and also one of the better throwers in that classificiaton in track and field. Look for a big year for the Shawnee Heights senior to be. Matthew Lange, Conway Springs, 6-2 230 Sr.
Lange isn’t a prospect at offensive line at the next level but he is pound for pound one of the strongest kids in the state for his size with a bench press of over 325 pounds. Lange also gets it done on the defensive side of the ball and will be one of the top two-way players in 3A this season. Trevor Little, Galena, 6-3 260 Sr.
Little is one of the better lineman in the small school ranks in Kansas. He is an athletic big man that is also one of the better pitchers in 3A this past season. Look for a big year from Little who should be the top offensive lineman in Southeast Kansas this fall. Tanner Mathias, Topeka, 6-0 260 Sr.
Mathias was first team All Non-Senior from Sports in Kansas last fall and will pave the way for Ky Thomas this fall. Topeka should have a solid line with Mathias and Garza both returning. Joe Michalski, Aquinas, 6-3 245 Jr.
Michalski returns with a loaded cast of players for Aquinas and earned all-state honors as a sophomore and All Non-Senior honors from Sports in Kansas. Mill Valley looks to 3-peat but if Aquinas plays as good as they look on paper coming into 2017, it’ll be hard for anyone in 5A to knock them off. Chod Morrow, Goddard, 6-6 245 Sr.
Morrow played left tackle last season for the 5A state runner-up Lions who lost in Double OT to Mill Valley in one of the most down to the wire games of all-time. He has added some size in the off-season and along with A.J. Vang should form one of the better lines in 5A to help protect all-state QB Blake Sullivan. James Morrow, Salina Central, 6-6 295 Sr.
Morrow is a project at the next level, his size isn’t, but has made serious strides over the off-season to put himself in a position to potentially earn a FCS offer. Salina Central has been down but return a few key pieces for 2017. Along with Luis Sotelo, the Mustangs should have a decent line to help pave the way for Taylon Peters. Nick Orr, BV North, 6-5 275 Sr.
Orr could develop into a division one prospect this season and looks to lead the line for a loaded cast of players on BV North for 2017. He will have to protect Miege transfer Graham Mertz, who has a division one offers, without a start under-center. If North has a big year it will have to start on the offensive line led by Orr. Lawson Schultz, Buhler, 6-0 230 Sr.
Schultz will be one of the top returning players in 4A-I this season and looks to help lead a loaded Buhler team back deep into the 4A-I playoffs. Schultz is a bit undersized but has speed, power and gets to the next level. Schultz packs a punch as a pulling guard for this Crusader team. Zach Titus, Desoto, 6-4 275 Sr.
Titus is one of the top returning defensive lineman in the state but also doubles as a nice offensive lineman. Titus was also one of the top throwers in 5A this past season and showed his explosiveness. A.J. Vang, Goddard, 6-2 270 Sr.
Vang was one of the top centers in Kansas a season ago as the Lions took runner-up in 2016. Playing for his dad, Scott, the Lions will look to make another deep run in 2017. Vang is one of the top returning players in the Wichita metro. Austin Youngers, Garden Plain, 6-0 245 Sr.
Youngers was a first team All Non-Senior pick from Sports in Kansas on offense last season and helped pave the way for Nate Pauly. Garden Plain is always loaded with talent and Youngers will look to help lead the Owls into the 3A playoffs. Seth Zegunis, Olathe Northwest, 6-4 285 Sr.
Zegunis was a two-year starter at BV Northwest but will play his senior season at Olathe Nortwest. Although he was one of the better lineman in the EKL he will now get to play in the Sunflower League for his senior year. Zegunis is a prospect at the FBS and FCS levels.